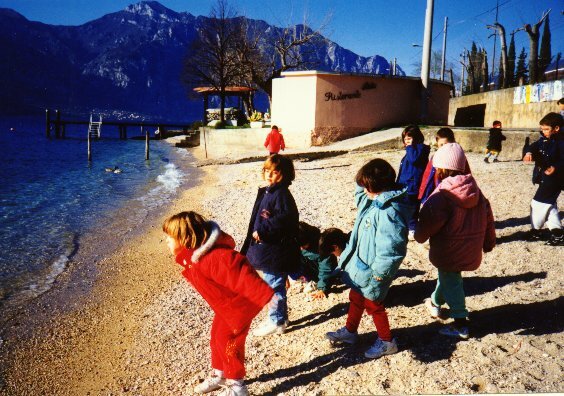 They went to the shores of Lake Garda, staying in a villa owned and managed by theÂ Comune di Milano (city government) specifically for the use of schools and summer camps. There are similar facilities all over northern Italy: in the mountains, on the beaches, and on the lakes. It’s obvious that Italian schools haven’t experienced the lawsuits so familiar to Americans. We were told in advance that one of the activities would be a boat trip on the lake. I asked about life vests – many of these kids couldn’t swim! – and was met with puzzled looks. The question was not satisfactorily answered, so I refused permission for Ross to go on the boat trip; one other mother followed suit. Ross was angry at being left out, but the teacher who stayed on shore with them bought them ice cream as consolation, so she got over it. They went on outings in the town, visiting crafts workshops and buying souvenirs. One night there was a disco for them at the villa (they had all brought dressy clothes for the occasion, their first dance!). During Ross’ elementary school years the trips were similar, always staying in facilities run by theÂ Comune. My memory isn’t clear; maybe they only made one or two long trips, and did day trips the other years. Ross also went to summer camps several times; this is another wonderful service provided by the city government, so that kids can get out of the filthy city in July while their parents are still working. Costs are low (and scaled to income), and you can choose from any of the locations where theÂ Comune has facilities; Ross always went to the beach. In middle school, the trips become more ambitious. After all, these kids are in Italy, with thousands of years of history and art (and stunning natural beauty) available within a few hours’ bus ride, if not on their very doorsteps. In 6th grade, they went to the Trentino region, staying in a hotel (school trips occur mostly in March, off-season for hotels all over Italy). They went on hikes in the mountains, visited a farm to see cheese made, and the Thun factory to see ceramic crafts made, and saw other local sights. 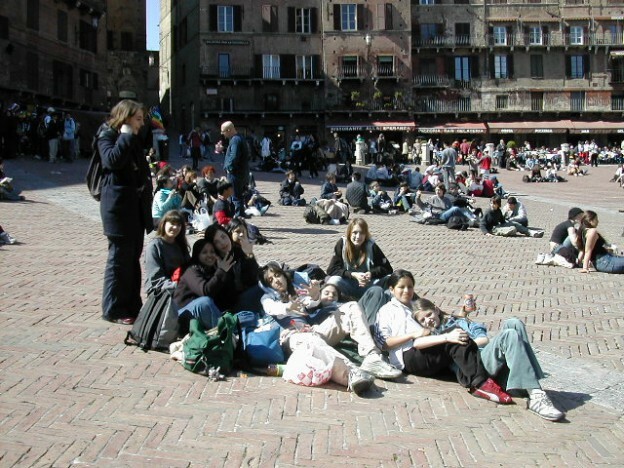 In 7th grade, they spent a week in Tuscany, on a galloping tour of several towns. Ross grew bored of churches, but, for the kids, the barrage of culture isn’t really the point of the trip: the point is being away from home with your friends, staying up all night talking, and getting into mischief. I admire the stamina of the teachers who accompany them! Many classes take a trip outside of Italy sometime during the middle school years. 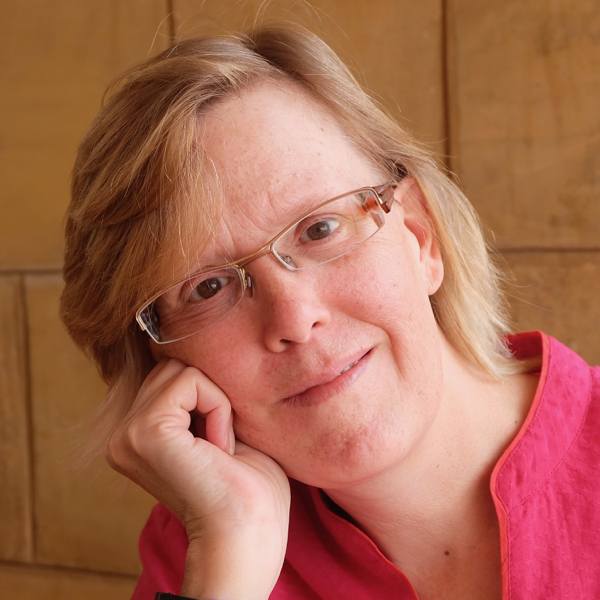 Ross missed out because she changed schools for 8th grade: her former classmates went to Austria this year, her new classmates had already gone to France last year (they are studying French as their third language). So this week she’s been in Tuscany again. But it’s not a great loss for Ross: she’s already been all over Europe and the US with her parents. This entry was posted in Italian education and tagged Italian education on March 30, 2003 by Deirdre Straughan.